We know how Internet usage is increasing across the region. comScore’s first comprehensive review of Asia-Pacific Internet Usage comes up with a few interesting findings. 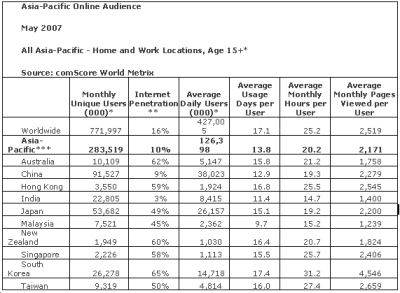 One, Netizens in APAC spend less time on the Net when compared to the West. But it does vary across countries – ranging from less than half an hour daily in India to more than 1 hr/day among the South Koreans. Two, Yahoo sites are the most popular in the region, unlike Google, which leads in the worldwide stakes. **Estimated Users age 15+ active within 30 days from Home or Work computer as a percentage of total country population age 15+. Entry filed under: all asia, digital, media general. Games For Lunch	Do media agencies need to hire creative people? This is interesting. I like to look at time spent with different media rather than just penetration figures. In China, we usually show a ‘media minutes’ chart where we take data from one source (TGI) and use the heavy/medium/light and other media channel classifications to arrive at average minutes per day for all main media plus DVD wathcing, public transport usage, etc. This was for young women in urban China. The main differences you see between this and penetration is that the internet looks far stronger than print/magazines, which have higher overall penetration, but much less interaction time. The usage of internet is increasing day by day especially in young generations. As all teens, my son spent too much time surfing the web. He was absolutely “addicted” to the Internet some time ago. Luckily, my friend advised me parental control software Ez Internet Timer. Internet timer is the only possible way that I know of to stop my child from going on of the internet. The usage of internet is increasing day by day especially in young generations. As all teens, my son spent too much time surfing the web. He was absolutely “addicted” to the Internet some time ago. Luckily, my friend advised me parental control software w w w . i n t e r n e t t i m e r . n e t Ez Internet Timer. Internet timer is the only possible way that I know of to stop my child from going on of the internet.